At Loveland Veterinary Clinic, we love caring for animals throughout the entire year. As your veterinarian, we’re dedicated to making sure your pets are happy and healthy, and we want to make sure that any situation that arises is taken care of as soon as possible. With winter on its way along the Front Range, it’s important to make sure that you and your pets are prepared for the cold and snowy weather. 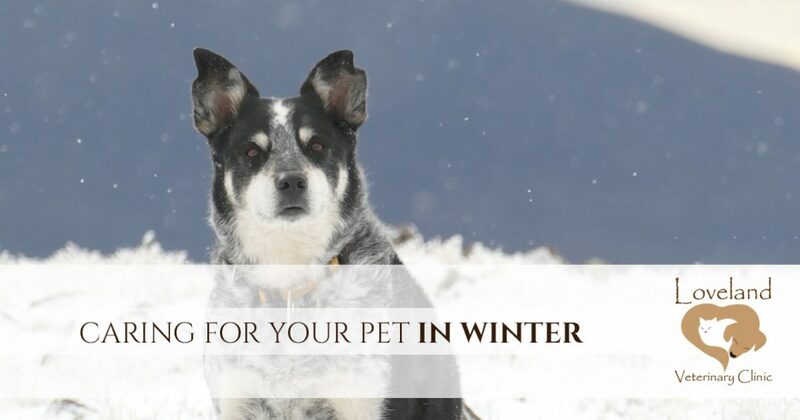 Caring for your pet in winter doesn’t have to be challenging, but there are some steps you can take to ensure they’re taken care of during the colder months of the year. Your dog loves going for walks, even when it’s freezing outside, and you might have little boots that you put on him to keep his feet warm. While the boots protect your dog’s paws against the cold, they also protect against deicing salt and other chemicals that can be found on streets and sidewalks during the winter months. The last thing you want is for your dog’s paws to become irritated, or for your dog to lick their paws after a walk. If you can’t get your dog to wear their little boots, then be sure to check their paws and wipe them with a warm, wet rag once you get home. Northern Colorado doesn’t have the worst winter weather, especially when compared to our neighbors on the plains to the east, but that doesn’t mean snow and ice won’t knock out the power every so often. If you’re a planner, then you likely have supplies stocked up for you and your family, but what about your pets? It’s important to make sure you have plenty of food, medication, and other things your pet needs on hand in case of a winter emergency. You’ll also want to have blankets ready to go in case the heat goes out. If you’re planning to travel with your pet during the winter, then create a “go bag” with all of your pet’s necessities in it, just in case you get stuck on your way to your destination. Your pet may spend most of its time inside during the winter, but you may still let them out during the colder months of the year. Dogs will have to go outside to do their business, but make sure that when you let them out, you remember to let them back in right away. Cold temperatures can take effect quickly on an animal, and if you don’t want to stand outside while they sniff around the yard, then make sure you set a reminder to let them in after a few minutes. If you have animals that live outside, for example, in a dog pen, then make sure they have access to somewhere warm. This might be the interior of your heated garage, or a heated dog house where they can sleep in comfort. If you have a pet door that grants them access to an interior area, then make sure the flap is in good condition so that it seals correctly and keeps the winter cold outside. At Loveland Veterinary Clinic, we want your pet to be happy and healthy this winter. 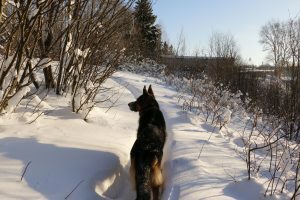 By following these tips, you can help ensure that your dog, cat, or other furry friend is safe from cold temperatures and other winter hazards. If you think that something is wrong following a walk or after your pet has been outside, then please bring them to our clinic right away. A licensed veterinarian will examine your animal and let you know what, if anything, is wrong. Above all, we want you to feel confident that your pet is in good hands.